Bright, punchy, and highly versatile, these tacos make a quick(ish) weeknight meal – or the beginnings of a spectacular Spring party. I also may or may not have eaten this, or a variation on this, for the entirety of last week – and may or may not have posted a melodramatic memorial to said lunch variation as a Picture of the Day. Paleo crepes (I used this recipe from Running To The Kitchen, but cut the eggs down to 4) – when making, I ladled out 1 scoop per crepe to make tortilla-sized portions. Note: be careful when using fresh fat in this recipe, the first crepe-tilla of each fat addition always turns out wonky for me. To make the salsa: Dice the rhubarb and pineapple and add to a small bowl. Chop the cilantro and add, along with the salt, molasses and lemon juice. Stir to combine. 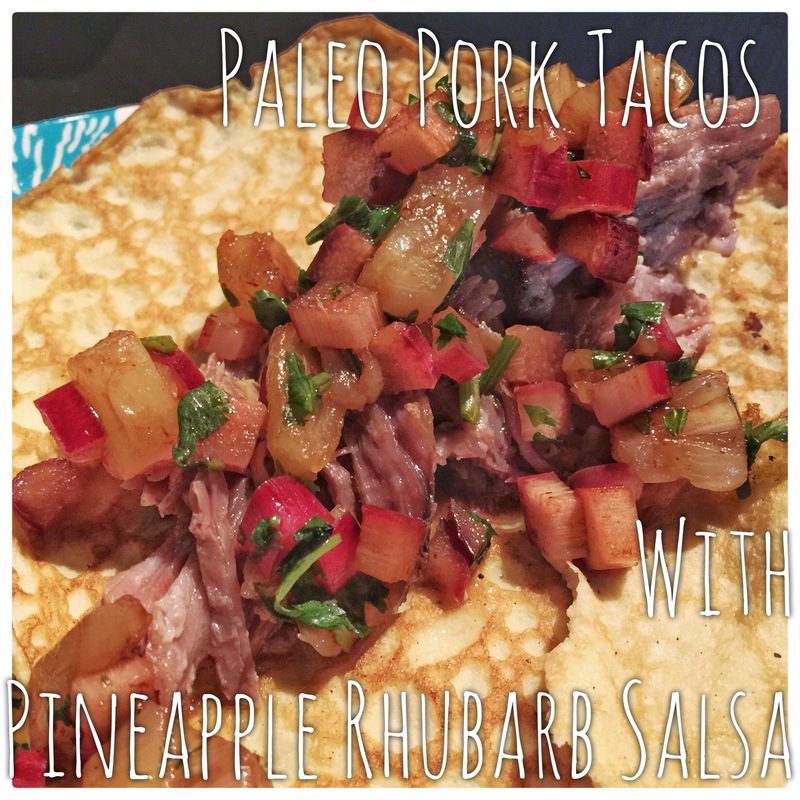 To serve: Place 2-3 ounces pork in the center of each crepe and top with salsa. Serves 2, maybe 3 if you have a nice side. this may be one of the most unique salsas I’ve ever read- sounds fantastic though! If you’re interested, I’d love for you to share a post in my blog link up tomorrow. All you need is the URL of a post you’d like to contribute and it’s a great way to network with some awesome bloggers. I wrote up a quick explanation on my main menu under ‘Tell em Tuesdays’. I hope you’ll join in! I was a little sad I couldn’t find rhubarb during this week’s grocery trip so I could make it again. And a link up sounds great – I’m in!